A bill has been introduced into the House which would would end the use of red light cameras to issue tickets to vehicles making right turns where right turn are permitted. House Bill 410, sponsored by Delegates Neil Parrott, Jason Buckel, Kevin Hornberger, Nicholaus Kipke, Trent Kittleman, Ric Metzgar, and Haven Shoemaker, would change Maryland's red light camera statute to state : "THIS SECTION DOES NOT APPLY TO A VIOLATION IN WHICH A MOTOR VEHICLE MAKES A RIGHT TURN AT AN INTERSECTION MONITORED BY A TRAFFIC CONTROL SIGNAL MONITORING SYSTEM"
The bill was prompted by outcries from motorists who received red light camera tickets while making slow moving right turns at intersections where right turn on red is not prohibited. When the City of Rockville began ticketing for right turns en-mass in 2012, some camera locations issued more than ten times as many camera tickets as they had prior to the new ticketing practices going into effect. The new right-turn-optimized cameras were activated without significant prior notification to the public and without updating the signage at the locations to note that tickets would be issued for right turns. One camera located at WB Gude drive at Gaither Road which had previously been issuing 36-83 tickets per month the year prior to the upgrade, issued 1813 tickets in a single month to motorist surprised by the City's new practice. Many of the tickets were issued to motorists in dedicated right turn lanes. We reported in October of 2014 that despite assertions to the press by Rockville City officials that the number of red light camera tickets had "dropped", in fact Rockville still issued more than twice as many red light camera tickets in 2013 than 2011 (the last full year before cameras optimized for ticketing right turns were installed). While the city asserted in response to public information requests that they did not keep any statistics about what number of tickets were issued for right turns, this would indicate that the majority of RLC tickets issued by Rockville may actually be for right turns rather than "straight through" violations. Rockville's ticketing practices permit issuing RLC tickets motorists who are traveling as slow as 14mph a short distance before reaching the intersection, and begin issuing tickets only 0.1second (literally a blink of an eye) after the light changed red. makes no mention of "right turns" at all nor do the "fiscal policy notes" for Maryland's original red light camera law. Many jurisdictions have chosen to interpret the state's RLC law to include ticketing for right turns, as well as in some cases issuing ticket to vehicles which did stop at a red light but partially ahead of the white line. 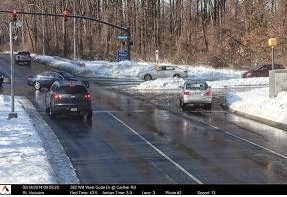 In one case, a motorist complained about being forced to pay a fine for a Rockville RLC ticket where the recorded video showed their vehicle DID fully stop before making a right turn, but had pulled slightly ahead of the white line in order to see around a piled up snowbank. The City of Rockville continues to defend such ticketing practices as legal. 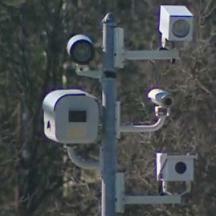 The Montgomery County government also installed the same model of new red light cameras. Montgomery County does sometimes issue right turn tickets, but uses somewhat different standards for citation review than the City of Rockville. When Montgomery County officials were asked why newly installed red light cameras were "flashing" motorists who were not making right turns, the officials lied to the press by stating these were "warning flashes". In fact there is NO standard traffic signal whatsoever for issuing "warning flashes" to motorists approaching. When a red light cameras flashes they are taking pictures, so the county and their vendor can look for "technical violations". However stating this directly does not fit local governments' narrative that "if you don't want your picture taken don't run a red light" and lying to the Public for PR reasons would appear to be an A-OK public policy in Montgomery County. A 1995 study on Right Turn on Red issued by the NHTSA to Congress found that right turn on red, under all conditions combined, was not a major cause of accidents. The report noted that "Right-Turn-On-Red crashes represent a very small proportion of the total number of traffic crashes in the four states (0.05 percent). RTOR injury and fatal crashes represent a fraction of 1 percent of all fatal and injury crashes (0.06 percent). RTOR crashes represent a very small proportion of signalized intersection crashes (0.4 percent)." The report further noted that " Thus, less than 0.2 percent of all fatalities involved a right-turning vehicle maneuver at an intersection where RTOR is permitted " while further noting that some of these accidents actually occurred when the light was not red for the turning vehicle at all and that the actual numbers are even lower than this would indicate.